Thank you to all of you who supported my recent e-mail prompt to sign the Ivory petition, it was extremely well received and I have opened many letters of support, sincere apologies to those of you overseas who received it as part of my client e-mail database, although you were unable to offer support, I felt as dealers and collectors of Japanese art it was vital to give you the latest information on this potentially damaging, and in my opinion ill thought out legislation. Whatever the eventual outcome, the damage to the UK trade and collectors has already taken its toll, the auction houses are full of once cherished family heirlooms and overage trade stock containing Ivory, it will come as no surprise that as dealers we are cautiously only hand picking select items, some that may in due course be captured by the proposed de-minimis legislation (currently under 10% Ivory content), difficult in itself, or higher quality fully carved Ivory works that we hope may fall into the “items of cultural, artistic or Museum quality” the unfortunate thing is nobody actually knows the parameters, and so uncertainty ensues, and as such the market stagnates. You may recall in last months members area we featured a stunning quality Japanese Ivory Okimono Bijin by a leading Tokyo artist, well she still currently awaits a new home, whereas last year she would certainly have commanded a higher price and possibly only lasted a few days, she is now likely to end up overseas if a new UK home is not found soon. I am so passionate about the Japanese arts and also wildlife conservation, there seems no natural link from Antiques (past tense) to the conservation issues faced today, I could say so much more given the right platform. But to briefly summarise the damage I see thus far, clearly even the threat of this legislation is depriving families of their once cherished family heirlooms whilst decimating the value of their collections, prohibiting dealers of some or all of their means of a livelihood, untold cultural and historic vandalism ensues whilst also stripping tens of thousands of pounds in taxes from the governments coffers, yet not one single Elephant will have been saved, it is a tragedy!!! Myself and fellow registered dealers and auctioneers would gladly support a 10% sales levy, attached to the sale of every “certified antique Ivory product “, it could simply self-regulate through the trade associations, and provide hundreds of thousands of pounds a year to fight the real cause of the problem, poachers in Africa, as well as corrupt officials both in Africa and Asia. In other more positive news the trade is waking from its annual Summer slumber, Asian art week in the USA is upon us, with gallery events, antique fairs and fine art auctions, we have representation at the largest of these, the Baltimore antiques show, where we are assured of first dibs on some great Japanese works of art, including works from a very special private collection that we have had the privilege to purchase items from in the past, please keep a keen eye on our website in the coming weeks, and our exclusive members area in the coming months. 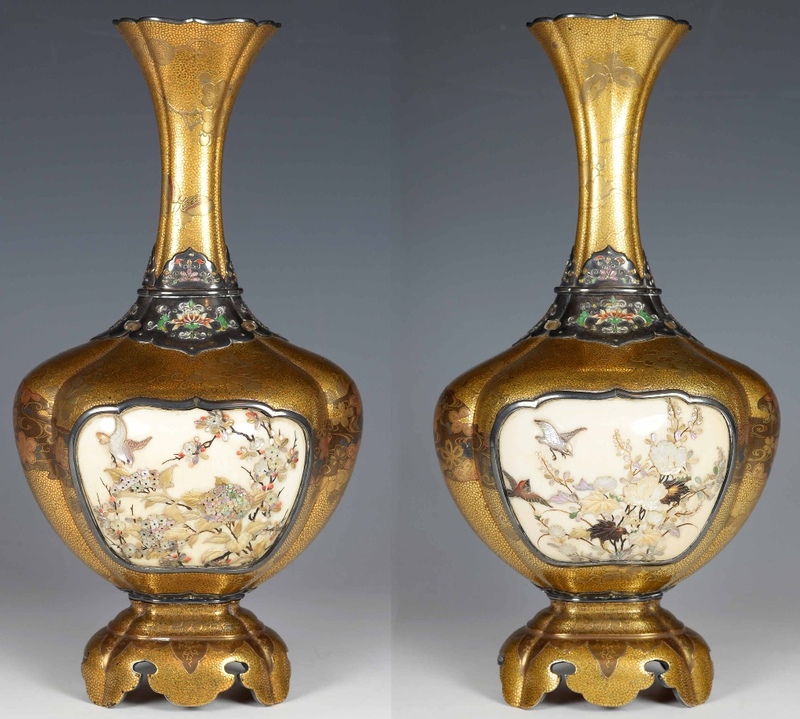 This months featured item in the exclusive members area are a pair of exceptional quality Japanese Gold lacquer & Shibayama vases, previously supplied by ourselves. Finally for this month it dawned on me that it is the 150th anniversary of the Emperor Meiji coming to power , the Meiji period or restoration 1868-1912 , and as a patron of the arts the Emperor gave so much to promote the skills of his country’s workforce during his lifetime. Back in 2016 I had written a brief potted history about the Meiji period on the home page of my website, and would like to share that with you, should you have a spare few minutes please take the time to read it. Japanese art from this period has certainly changed my life, in fact it is my life, thank you for allowing me the opportunity to share a small part of this with you.